Steve Jobs’ Death Saddens & Raises Estate Planning Questions | The Levin Law Firm - Philip Levin, Esq. The recent death of creative visionary and Apple co-founder Steve Jobs saddened the world. News of his death traveled like wildfire, and had the online social networks humming with tributes, memorial posts, and sentiments of grief. Mr. Jobs was very private about his personal life, but through his public appearances, and his support of various creative enterprises, he touched and changed the lives of many individuals; just as his visionary ideas changed the face of technology. The sad announcement of his death has many people now wondering “what next?” How will this change the company he started? What will happen with his family? As this article from ABC News relates, “The ever-private Steve Jobs was famously secretive when it came to Apple’s new products. As with his personal life, the future of Steve Jobs’ wealth [and family] will also stay under the radar.” It is evident that Mr. Jobs took the time needed to develop and implement a well conceived transition plan for the firm he started to very seasoned members of his management team. The article mentioned above states that “Given Jobs’ vast wealth and penchant for privacy, he likely set up private trusts for his family and charitable purposes.” Asset preservation trusts would certainly have been one of the wealth transfer planning tools utilized in Mr. Jobs’ estate plan for a variety of compelling reasons. Both Revocable Living Trusts and Testamentary Trusts can be designed to contain flexible provisions for the management, investment, and distribution of property accumulated during a client’s life. 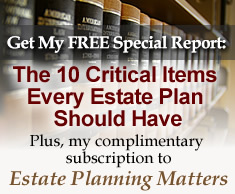 In essence, trusts can be a powerful tool in the estate planner’s arsenal to ensure that a client’s property distributes to who they want, when they want, and how they want their property to be received. Trusts can also be designed to provide a much greater amount of protection for assets owned by your client, especially when compared to an outright distribution under the terms of a simple Will. Since trusts are confidential legal documents, which are not probated like a Will upon death, if Steve Jobs utilized a Revocable Living Trust in his estate plan, it is very likely that the public may never learn exactly to whom and how he chose to distribute his wealth. However, it is probably safe to assume that in addition to providing for spouse and children, he may have left a considerable amount to charitable or visionary endeavors. It has been said that, “Twenty minutes before the prom is no time to start taking dancing lessons.” This is especially true in the context of estate planning. Begin a discussion with your clients today about the importance of having an up-to-date estate plan – and sooner is better than later. At The Levin Law Firm, we listen to the goals of our clients, then establish and implement effective estate plans designed to achieve their objectives. In order to help your clients to achieve their estate planning goals, please call The Levin Law Firm to arrange a Complimentary Consultation at (610) 977-2443.